The current financial crisis has brought trouble to families from USA to Asia. As always the rich are getting off the hook by getting bailed out by the government while the middle class and the poor are the ones taking the full hit. Foreclosure rates in USA are up 30% compared to last year and almost 300 000 homes in the US got a foreclosure notice in February. Things are equally bad in UK – home repossessions are up 92% compared to the third quarter of 2008. People who lost their jobs and who used to live from paycheck to paycheck are the first ones to lose their home – no income means not being able to afford mortgage payments. To determine how long you can sustain your current lifestyle without losing your home you should check out how to calculate how much F*CK YOU money you have. Jobless people are forced to move out of their homes. The one’s with family and friends who are willing to take them in are in luck! There are however some people who have no other option but to live in tents. 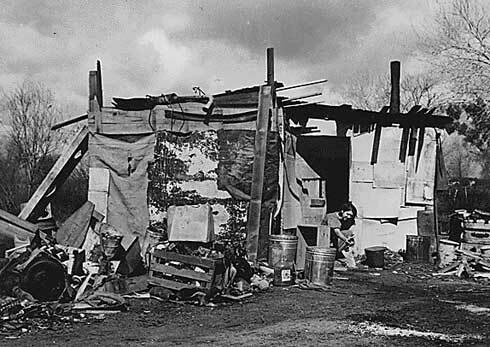 Millions of people lost their homes during the Great Depression. 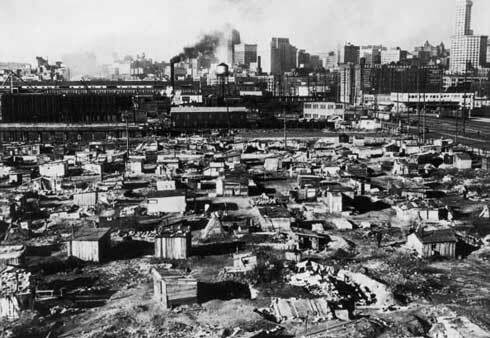 Those who weren’t lucky ended up in Shanty Towns – tent cities built by the poor for the poor. 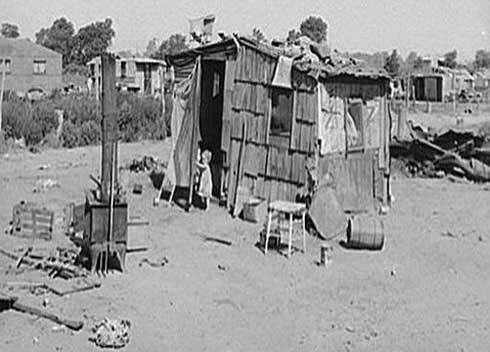 At one point Shanty Towns or Hoovervilles as they became known later were home to more than 1 million Americans. It might come as a surprise to a lot of Americans that just as during the Great Depression people who have lost their homes are once again flocking to live in tent cities. 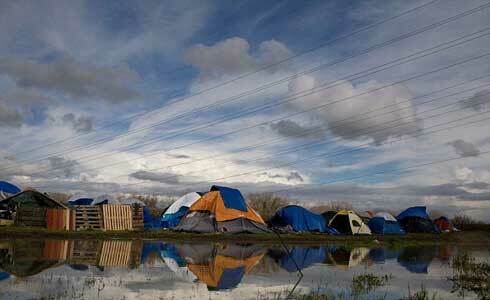 Here are a few pictures from a tent city in Sacramento, California. If you are still not convinced that tent cities exist in modern America, take a look at this news report from BBC – the national TV station of Great Britain. Need some fast cash? Cash Advances from CashAdvancer.com can help you within an hour! Are the tents owned or where they purchased via 3 phase hedged multi-party financial derivative? Lol, I see what you did there! Nice point! The first tent photo, where is that located? It actually looks nicely organized, and are those generators or something in the middle? Do you mean the colored picture or the one in black and white? Thank you for the answer Roman!! the first one with conical tents are from Saudi Arabia organized for the annual pilgrim of Muslim Hajj.. that’s why they look organized as these are supported by Government which are fire proof and provided with Air Cons !! To be fair, most of these tent cities were already in existence before the housing bust. Alternative living is a trend that will be more apparent as this recession/depression plays itself out. Anyone reading here thinking about tent cities as a last resort due to extreme economic hardship might want to do searches online for cohousing and use search words such as alternative housing, yurts and communal living. 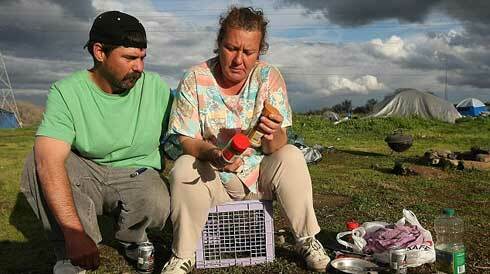 Tent city in Sacramento was a surprise to me when I saw it on tv but the stories of its residents are not. Many were earning $50K or more before losing their jobs, being unable to find a job or being able to afford the training to retrain in an unrelated field or were unable to work any straight commission job or start a business of their own. I will be starting a business soon after my company a mortgage banker closed forcing a layoff of about 200 people. In December 2008 I was present at an Employment Development Department Job Fair for Financial and Construction professionals, the invitation arrived in the form of 2 identical envelopes with 2 identical letters complete with Gov. Schwarzenegger’s signature on them (I thought before opening them that it was going to be bad news, perhaps a cancellation of my Unemployment Benefits due to the state of California’s economy.) The expected turnout was to be no more than 300 for the event, instead over 1000 of us showed up and it was televised on the evening news on San Francisco’s KTVU and all other local stations (KTVU was there interviewing as were a few others and photographers taking still shots both outside where the line snaked around the hotel and inside as well. In the past after two other layoffs and closures, one company was a specialty retailer that decided to close their call center and the other a loan company and even when dissatisfied with a current employer I have always been able to hookup with a new position within 1 to 3 weeks. Not this time and after wearing out my printer (by printing several thousand letters and resumes to mail out or hand deliver) and exhaustive calls and actually going door to door I decided after all this time to stop the madness and start my own wholesale/retail business so I can transfer my skills without waiting any longer and urge others to do the same. Yes, we definitely live in a messed up world. And it will always be a messed up world, but I guess we make the best of what we have.